Former Nigeria coach Stephen Keshi has demanded US$5m (£3.2m) compensation from the Nigeria Football Federation following his dismissal from the job. Keshi was sacked at the start of July and has been replaced by Sunday Oliseh. He has written to the NFF through his lawyers demanding the money, claiming damages for defamation. However, NFF officials believe the claim has no substance and are confident the body will not be forced to compensate Keshi. BBC Sport understands that Keshi is anxious to protect his reputation and profile in football circles after the NFF disciplinary committee made various allegations against him. 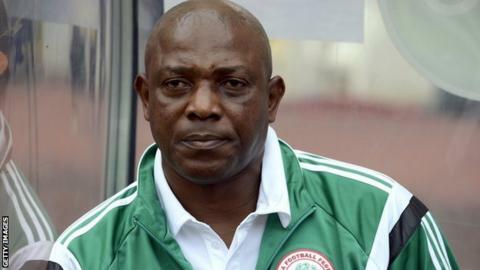 Keshi has yet to take the case to court as he is hoping the matter can be resolved amicably. The former Togo and Mali coach becomes the second former Nigeria coach in five years to protest against dismissal by the NFF - his predecessor Samson Siasia launched legal action in October 2011 but later withdrew his case and said he wanted to look ahead. Keshi, a former captain of the national team, led the side to the 2013 Nations Cup title in South Africa and also steered the Super Eagles to the Round of 16 at the 2014 World Cup in Brazil. His contract was not renewed after the World Cup but he later returned on a match-by-match deal, which ended in November after the team's failure to reach the 2015 Nations Cup finals. As caretaker coach, Keshi endured a turbulent 2014, in which he was sacked by the NFF and only reinstalled after intervention from then Nigeria President Goodluck Jonathan. The 53-year-old, who returned for his third spell in April, led his side to a 2-0 home win against Chad in a 2017 Africa Cup of Nations qualifier in June, but was shown the exit door after less than three months into a two-year deal.